(Updated with thanks to Anita O'Brien): London's Cartoon Museum has announced it will host an exhibition of art charting Doctor Who's career in comics, from his very first appearances in TV Comic in 1964 through to the present day. Doctor Who may not have had an unbroken run on television since the character's debut in November 1963, but his adventures have continued in comics since 1964, spanning titles such as TV Comic, Countdown, TV Action, Doctor Who Weekly and, more recently, Doctor Who Adventures and IDW's US comics. Doctor Who in Comics: 1964 - 2011 will encompass one of the Museum's three galleries and the venue will also host tie-in classes. There's no details yet on which artists' work will feature in the exhibition, but the character has been drawn by a huge number of talents, including Dave Gibbons, John Ridgway, Richard Piers Rayner, Adrian Salmon (who has drawn the latest adventure in Doctor Who Magazine), Jamie Smart (currently busy working on a new Doctor Who part work), Lee Sullivan, Roger Langridge, Mike McMahon, Gerry Haylock, John Canning and many others. (with thanks to Pádraig Ó Méalóid): The most recent issue of Strange Attractor Journal contains, amongst much else, the text for Alan Moore's unfinished John Dee opera, focusing on the life of the well known English mage, which he was originally meant to be developing alongside Damon Albarn and Gorillaz, before they went their seperate ways on this. "I believe that, besides the complete unfinished text for the opera - if you see what I mean - there are also notes on staging and other aspects of the project," Pádraig Ó Méalóid tells us. "In some ways, the most fascinating of Alan's works are the unfinished ones, as the potential they represent will always be just outside our reach," feels Pádraig. "However, more information is coming about about some of these: for my own part, I was thrilled to be able to publish the pages from Big Numbers #3 online (here on Padraig's LiveJournal), and Gary Spencer Millidge's upcoming biography of Alan contains a copy of the legendary Big Numbers wall chart, so much that was once unknown will now be revealed. "Alan also spoke to me recently about how Halo Jones would have finished up, and now we have this piece about his John Dee opera. Who knows? The 1963 annual might be next. OK, maybe not..."
As well as its Alan Moore conetnt, the eagerly awaited fourth edition of the acclaimed anthology series, featuring nearly 20 new articles exploring the outer shores of culture, history and experience. 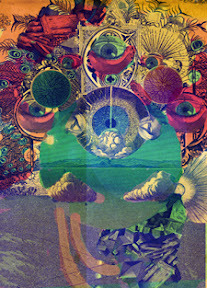 First appearing in 2004, Strange Attractor Journal has been described as "one of the most weirdly beautiful, beautifully weird magazines of the past hundred-odd years" (by the Independent on Sunday) and "what you get when poetic archaeologists of the imagination gather their finest jewels" (by Erik Davis). Available now from Strange Attractor Press, publishers of Medical London, Welcome to Mars and Austin Osman Spare. This week’s Panel Borders radio show begins a month about anthologies and collectives; Alex Fitch talks to the editors of two comic book anthologies which are printed in newspaper form; Richard Cowdry about his anthology, The Comix Reader, a new 24 page newspaper anthology inspired by his love of old newspaper strips, cinema cartoons and his connections with the alternate press scene; and Matthew Sheret about his twice yearly anthology Paper Science, published through his company We are words and pictures, an anthology which showcases brilliant design and the best up-and-coming comic book creators. Advance ticket sales for next month’s MCM Expo London Comic Con - which includes the presentation of the Eagle Awards - have just topped an incredible 15,000, the highest recorded at this stage in the show’s decade-long history. The event's organisers say that with demand for advance tickets skyrocketing, the MCM Expo is expected to hit the 60,000 visitor mark for the first time this May; 10,000 more than the total number of people coming through the doors at October’s show. “We are absolutely delighted to see advance sales so high eight weeks ahead of this year’s show given that most of our sales usually happen in the two months running up to the event,” said MCM Expo co-organiser Bryan Cooney. As well as teaming up with GameSpot UK, the upcoming MCM Expo London Comic Con will sport superhero movie Green Lantern as its official title sponsor, play host the prestigious Eagle comics awards and welcome X-Men: First Class and Thor writers Ashley Miller and Zack Stentz as special guests. 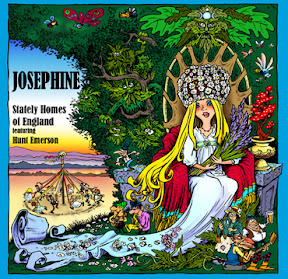 Birmingham-based cartoonist Hunt Emerson is to release a single, Josephine, on May Day 2011. Released on the new Spritely Records label, Josephine is a song by legendary singer-songwriter John Otway and described by Hunt as "an epic tale of innocence lost set on a village green during traditional revels." all packaged in a special envelope. will be exclusive to each CD. The highly collectable Deluxe edition of Josephine will be priced at £100. 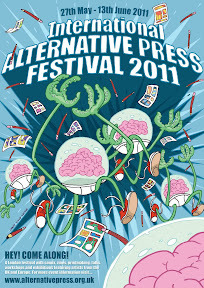 Hunt has a longtime connection with the British music business as well as his amazing cartoons for the likes of Fortean Times, The Beano and other titles. In the past he worked with bands such as The Beat (currently on tour, by the way) and Jazz Butcher (google them if you've never heard of them, their music is great fun). 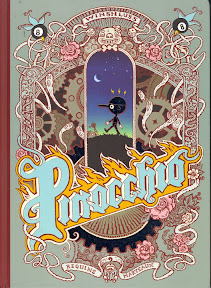 Foyles London is currently hosting an exhibition of original artwork from Pinocchio, the award-winning graphic novel by French comic artist Winshluss, which will be published by Knockabout Comics later this month. Winshluss is best known for co-writing and co-directing the animated film Persepolis. His new book, which won Best Album award 2009 at Angouleme, is an adult noir retelling of Pinocchio, that at times is both comedy and tragedy, but with a very modern twist. Pinocchio is no longer the sweet wooden boy but a robot-like android, Jiminy-cricket is a cockroach and Monstro has become a toxic, giant mutated fish. The story begins with a shooting, and then flashes back to Pinocchio's creation and adventures. Collodi's original story is also darker than Disney's version, while at the same time very funny. The artwork is primarily done in pen and ink, and watercolor but switches to paint for larger splash panels. The Festival opens on Friday 27th May at the Miller in London Bridge for a live draw/music/spoken word performance with Resonance FM's Radio Orchestra. On Saturday 28th and Sunday 29th May the Main Fair will take place at London's Conway Hall; two days showcasing Comix, Comics, Zines, Artist's Books, Print- Making and Radical Literature, as well as screen printing and DIY fashion workshops, talks and lots more from home and abroad. • “Stripburger - a taste of the premier Slovene Comics Zine” At Orbital Comics, London from Saturday 28th May to Sunday 12th June. • “The Swedish Collection: An exhibition of students from the Malmo Comic Art School” Featuring the work of ten artists from the Comic School in the South of Sweden, at The New Gallery, London, from 30th May to 5th June. • "Visions of the Walworth Jumpers" a mural painted over a week at the Sassoon Gallery, London, in a collaboration between street art, comix and fine arts, between 30th May - 5th June. There will be a Benefit Gig on 22nd April to raise money for the International Alternative Press Festival, featuring Vets In Hong Kong, Dead Sea Navigators, Cineplexx, Extradition Order and Baaneex. 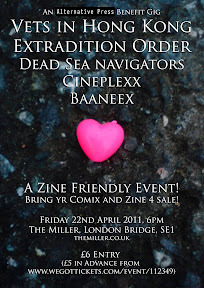 The Gig is at the The Miller Pub (www.themiller.co.uk), 96 Snowsfields Road, London Bridge, London SE1 3SS and if you're a zine maker, bring your zines to sell, and have some fun! Tickets are available now from http://www.wegottickets.com/event/112349 for £5, and will be £6 on the night. Check it out on Facebook and invite your friends. (with thanks to The Emperor over on the downthetubes Forum): Regular readers will recall our announcement about a Charity Comic organised by the Comic Book Alliance to raise funds for the victims of the Japanese earthquake and tsunami (see news story). • For more information about the CBA project read our news story; if you would like to take part please contact Tim Pilcher by email via foundersATcomicbookalliance.co.uk for further details about formats, deliveries, or any other questions you might have.